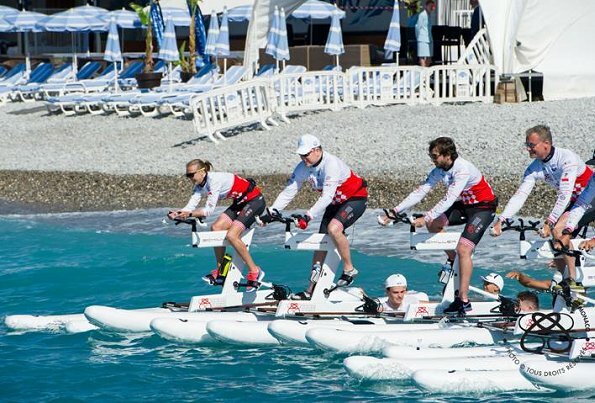 Prince Albert of Monaco and Princess Charlene of Monaco were at "Riviera Water Bike Challenge" (RWBC) held at Monaco Yacht Club on June 4, 2017. 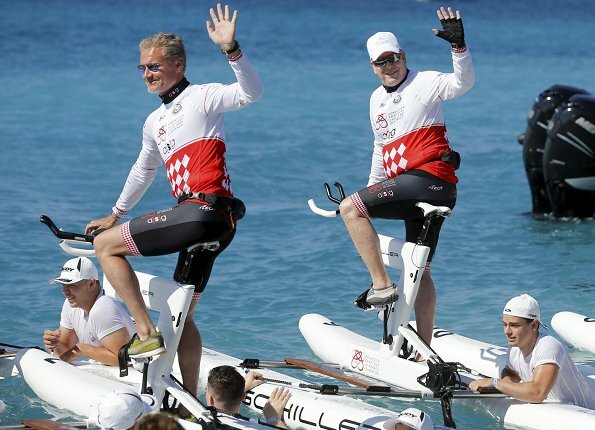 RWBC is a 21 km relay race between Nice and Monaco and held for the first time this year. Prince Albert joined the race as a contester. 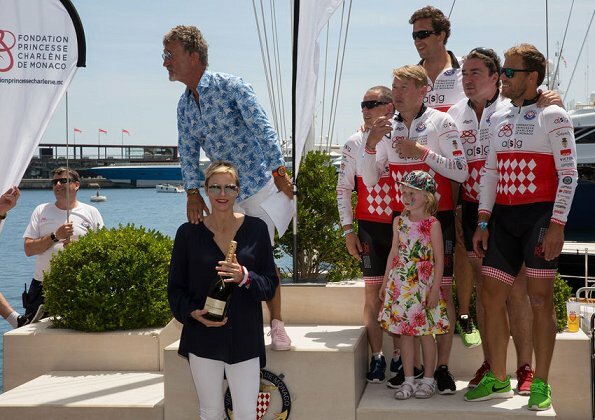 Princess Charlene could not join the race because of a light injury in her wrist, she watched the race and presented awards to the winners. 10 teams each consisting of 4 persons joined the race. Shame she couldn't take part. She looks wonderful - her hair is great with this summer blonde and tousled look. I love the pop of red lipstick and she looks smart but casual - absolutely spot on for this event. Charlene looks lovely and sophisticated. The "Hubby" has to work on his beer-belly a bit (just joking) ;). Say what you want,- and there are not so nice words/rumours about Albert from time to time-, I do like him!! 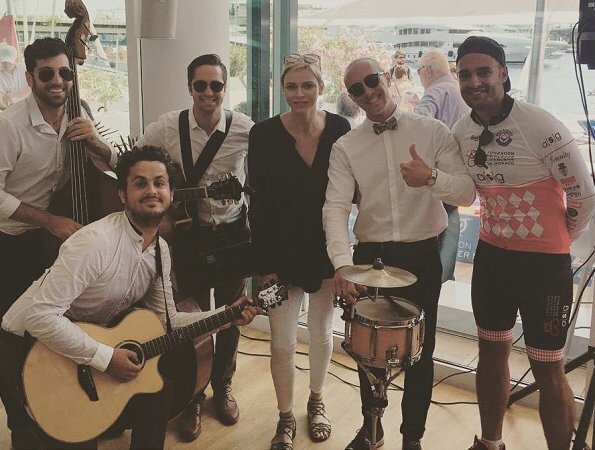 When he speaks, he comes open-minded, honestly really friendly, has strong similarity to his late Mum, Grace Kelly, and seems to care about the people in Monaco. (I mean the less fortunate ones too.) Good one. At last we hear about another "Kelly" in the water sports. I just looked up Prince Albert's grandfather and uncle who were Olympians and now he is married to one. Maybe those little twins will be really something in the sport world. Good for all of them! Désolée.Kelly père a remporté 3 médailles d'or,donc il est champion olympique . Charléne a fait partie de l'équipe sud-africaine de natation mais n'a jamais été championne olympique. Ça n'empêche pas Albert d'avoir de belles jambes ! Myriam, I did check to make sure I did NOT say she was a champion, just an Olympian - but that is quite an accomplishment, too, is it not? Albert is an Olympian in his own right - he competed in bobsleigh. The softer pixie cut and the blonde streaks really suit her! Charlene looks really great here. Those shades are to die for. Isn't that her brother far right? het zijn rodel bladen ,die liegen alles ,en daar krijgen ze geld voor !!!!! charlene en albert ik wens jullie heel veel liefde toe ,met de kids!!!!! Charlene is amazing, casual look but still very elegant, Albert adores her!! Susan, we all do hope so, ha ha... Yeah, but I think you are right. Hope they love each other.